Wood privacy fencing is one of the more popular fence styles in Waxahachie, Texas. If properly maintained a wood fence can last up to 20 years. A clear stain or seal will preserve and maintain that natural western red look while providing a longer life of your wood fence. Changes in widths and accents allow us to easily customize different looks. When you’re considering putting up a privacy fence, you’re likely looking at wood fences made out of red cedar. Red Cedar tends to last longer when out in the elements, especially when it comes to the unpredictable Texas weather. Red Cedar is a hearty and durable material that lasts longer than other materials, especially because we use ¾ inch boards to ensure its strength. The cedar’s natural resistance to termites and other insects also help its longevity. We also use steel posts to ensure your fence will last! We can handle a host of different wood styles, allowing you to not only match the practical needs of a privacy fence with the finish of custom carpentry. For example, you can opt for a cap and trim fence or board on board fencing to change the look of your yard. If you’re in need of something entirely different, think about choosing one of our less traditional fencing options; horizontal, bull panel, western red cedar or split rail. 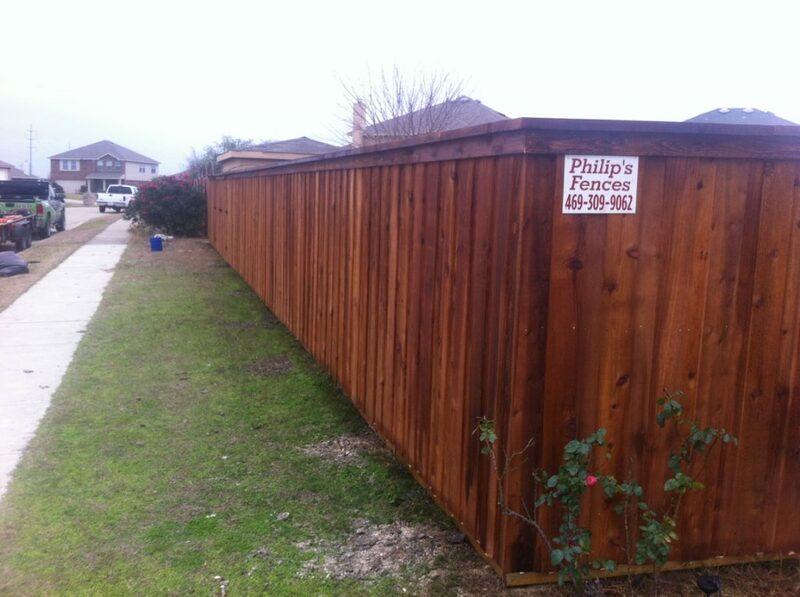 Contact Philp’s Fences for a free consultation so we can help you choose the right option for you!